Within the hobby, to our knowledge, a method for identifying first printings of Beginner Books has not yet been published. 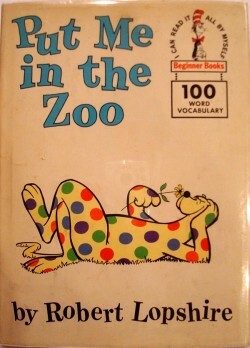 Several of the high dollar Beginner Books have well documented first edition identification points, notably the Seuss illustrated and/or authored books via the Younger/Hirsch Guide to Identification. Identification points for the other books in the series have not been well documented so those who stumble upon a dust jacketed Beginner Book resort to some amount of sleuthing. Book sleuthing, although not usually replete with pain and anguish, does involve a fair use of time and labor looking through folders accumulated with years of unkempt notes, probing the internet, auction logs, and perhaps phone calls or emails to carefully culled sources. Sadly, even the most ardent of sleuthing does not always lead to a successful conclusion, especially with such as Beginner Books, being neither extremely valuable nor widely regarded as highly collectible, the Seuss books of course being the exception. This is good news to us, the ‘nor widely regarded as highly collectible’, since we understand the importance of the Beginner Book series in sculpting the definition of the ‘early reader’ and its subsequent publishing success over the past 40-some years. For more on the history and importance of Beginner Books, please see our webpage on collecting Beginner Books. The scope of our research encompasses the Beginner Books issued originally with dust jackets, so spanning from 1957-to-1972. Children being what children be, most of the original dust jackets perished or became very diminished in nature soon after purchase. Dust be to dust. Because of this, even non-first, but early printings in a nice dust jacket are to be prized, with first editions difficult to come by. In most cases, the DJ information is key to correctly identifying a first edition Beginner Book, therefore, sans jacket, there is little collector interest. The exceptions are books with ‘First Printing’ on the copyright page, which will have collector interest, and are listed below. The first Beginner Book, The Cat In The Hat, published in March 1957 originally sold for $2.00 (‘200/200’ on front top right DJ flap), but the price was reduced in late-1957/early-1958 to $1.95 (‘195/195’ on front top right DJ flap). From 1958 to 1972 Beginner Books remained at a selling price of $1.95. Random House raised the price to $2.50 in 1972. In only a couple of instances is the price on the DJ necessary to identify a first edition Beginner Book. Stated ‘First Printing’ on the the copyright page. A dust jacket unique to the first printing. 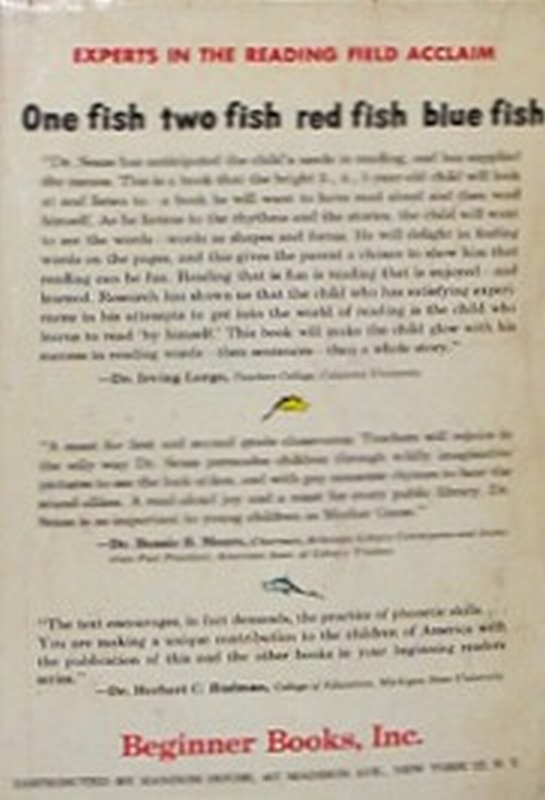 A dust jacket with the correct sequence of Beginner Books. Fourteen books have “First Printing” stated on the copyright page. Please see the following table for the listing of the books. Prior to 1960, Beginner Books existed as an independent publishing company, and the books were distributed by Random House. 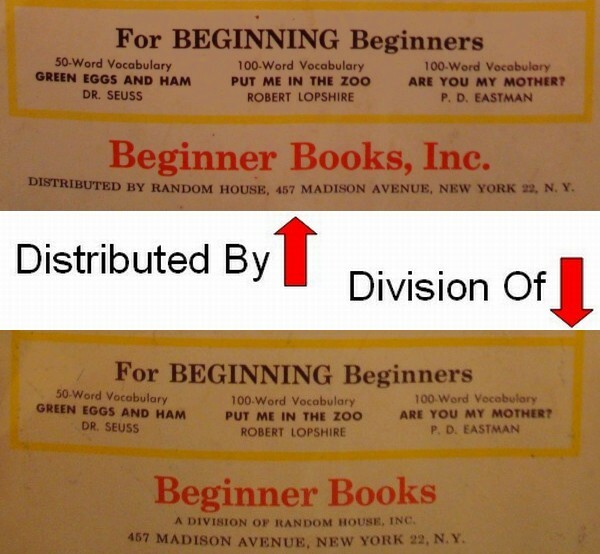 In 1960, Beginner Books was sold to Random House and became a division of the company. The true first printings of the first seventeen books will have “Distributed by Random House” on the book and dust jacket in addition to the other identifying points enumerated in the table. Later printings of these books will have a “Division of Random House” on the book and/or the dust jacket. This point is crucial to identifying true first printings of the first seventeen Beginner Books, since Random House did print “First Printing” on the copyright page of several of the books after the transaction. In these instances, the book is a first Random House printing, although not a first printing in the collector sense of the phrase. For example, we have two copies of Beginner Book B-9, The Whales Go By, each stating ‘First Printing”, on the copyright page, and indicating copyright 1959. However, in the first copy, which is the true first printing, the back dust jacket lists only twelve books, from The Cat In The Hat (1957) to Book of Laughs (1959). This book is printed by Beginner Books, Inc, and distributed by Random House. The second copy, also stating ‘First Printing’ on the copyright page, lists books from The Cat In The Hat to Are You My Mother? (1960). This book is published by Beginner Books, a division of Random House, and is therefore not a true first printing. Beginner Books which state ‘First Printing’ on the copyright page and are also distributed by Random House, are the true first printing of the book. Three first edition Beginner Books have dust jackets that were not used on any other books in the series. 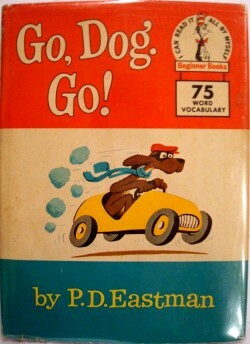 The dust jackets were unique to the first edition book. he Hat, the first Beginner Book, has a unique back dust jacket which was not used on other books in the series. 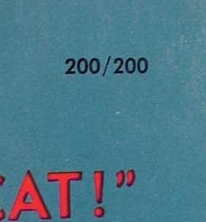 The first edition The Cat In The Hat can be identified by the ‘200/200’ price ($2.00) on the front dust jacket flap. The two other books with ‘unique’ dust jacket backs are Hop On Pop, and One Fish, Two Fish, Red Fish, Blue Fish. While the back dust jacket of most Beginner Books listed the other books in the series, the dust jacket backs for these two books contains reviews of the particular book. 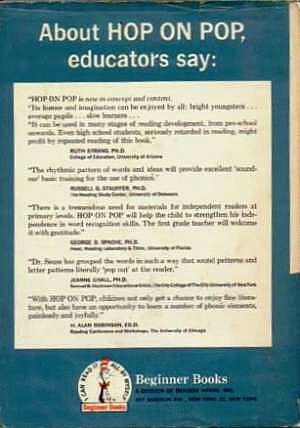 For Hop On Pop, the top of the dusk jacket back states “About HOP ON POP, educators say:” followed by five reviews. For One Fish, Two Fish, Red Fish, Blue Fish, the top of the dusk jacket back states “EXPERTS IN THE READING FIELD ACCLAIM”, followed by three reviews. For both Hop On Pop and One Fish, these unique review backs were only used on the first printings. Without the dust jacket, it is not possible to identify a true first edition of either book. Continued in Part 2, "Identifying First Edition Beginner Books With Correct Dust Jacket Listing".